What Would Dr. King Think of Our Progress? Frigid. I cannot remember a King’s Day celebration that wasn’t. Born on January 15th, the Rev. Dr. Martin Luther King, Jr. was remembered today in many places throughout the country on what would have been his 90th birthday. 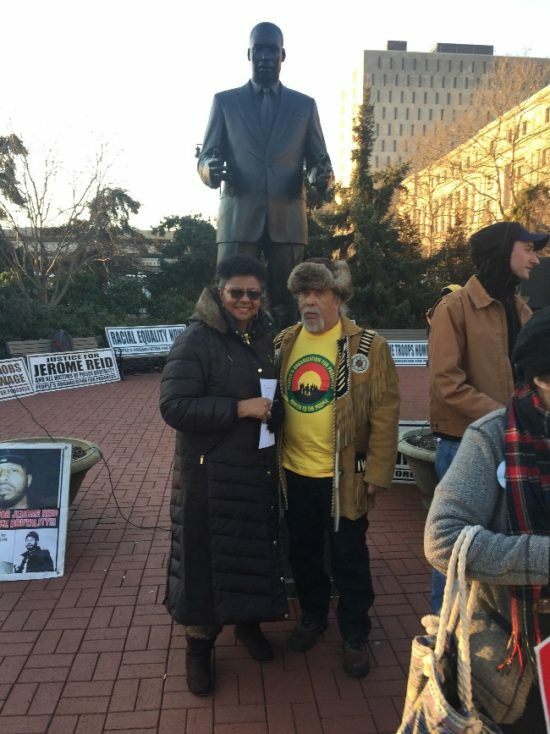 Here today, Chief Dwayne Perry and I were in Newark, New Jersey, participating in the demonstration with the Peoples Organization for Progress. The march slowly began in front of the MLK monument. As we drove around searching for the location, we reminisced about our younger years, trying to find work, direction and purpose. What would we have done at Dr. King’s young age? How did he manage? It’s interesting to know that Chief and I traveled in the same parts of New York City at different times, Bedford-Stuyvesant in Brooklyn and the Bronx, areas that were dangerous; drugs were brought in to the old neighborhoods, the steady climb toward mass incarceration began. The dreams of the Civil Rights era shattered by Urban renewal, which at first seemed like a good thing only to find that it really meant urban removal of Black homes and businesses. The drive showed us the changes made in the city; large empty lots, huge sections of new builds. The communities are impacted with gentrification. Again, at first it seemed like a good thing, but then, it wasn’t. Our communities are co-opted, our businesses cannot pay the high rents, our homes are being taken over by developers. It’s as if the clock had stopped. Dr. King had preached that we each needed to become leaders. In our own way, we and those we gathered with took that to heart, to continue the struggle. What would Dr. King think of our progress? Our society does a kind of slow dance with its people of color, one step forward, two steps back. We had a Black president for eight years, and now the progress we made is being systematically rolled back. Dr. King would want to know that we are still positioning ourselves in justice work, that we are still mobilizing, we are still working for income equality. In his speech on economics and reparations, he outlined how our government subsidized the white peasants from Europe with land, with colleges to educate them on how to farm the land, and with tools and supplies to use to produce their farms and machinery to work the land. This same government had refused to provide any land for former enslaved people. Those same immigrants are now receiving millions in subsidies not to farm and with their privilege, telling Black people to pull themselves up by their boot straps. King’s tone and stance had changed over time, as he came to see that conditions for Blacks and poor folks remained the same. Martin was angry as he advocated for a radical redistribution of wealth. He challenged us to march on Washington and demand to get paid. Today, we are only just approaching a living wage as laws are past for $15.00 an hour. Our income disparity has grown with new tax breaks for the rich, while the lower classes are forced to pay for defense, infrastructure, and perhaps a new border wall. Corporations pay wages below the poverty line and those who are incarcerated are paid dollars a day to manufacture goods. Even more egregious, is using untrained inmates to fight fires and handle other natural disasters, their humanity seen as expendable, their lives as throw-a-ways. What can we do to help them, what can we do for the children held by the thousands in detention centers at the southern borders, or the families marred by gun violence, those in government working without a pay check, to say nothing of our endless wars? What would Dr. King make of our current dilemma? Our march focused on the deaths of so very many of our youth at the hands of police. This is surreal in Newark, New Jersey, today. The litany of names read echoed into the cold. We know that those who protest these acts are demonized in the media, but we are in solidarity with them. Voices of intolerance have gotten louder and bolder, evoking concern and fear. And still, we pressed on. We sang songs of the movement, teaching a new generation to carry on the tradition. The senior organizers were passing the baton to the younger college students. Chief Perry reminded the crowd gathered to use their right to vote, and their advocacy to encourage others to do the same. We have to combat voter suppression nationwide. There are those who claim that voting is happening illegally, taking away from the fact of their suppression of this precious right, so many have died defending. He is heartened by so many women in Congress, he feels the tide is turning in a new and better direction. I am reminded that “the arc of the moral universe is long, but it bends towards justice”. The calendar has turned, we are fifty years later than when Dr. King was with us, and the struggle continues. On his birthday and every day, it does not matter how cold it is, Dr. King continues to walk with us, as a revered ancestor, whose constant and abiding love holds us in faith. His voice echoes on, teaching and inspiring us, giving us hope as we continue to work for justice and our Beloved Community.